The gentle drops of falling rain. A lonely willow tree standing near a graveyard. And a Japanese ghost, called a yūrei, waiting below. This is our image of a yūrei, and when we imagine this picture of the yūrei, it has no feet. But why? When yūrei are compared to the ghosts of neighboring countries like China and Korea, it is the ashinonai, or footless, aspect that is considered uniquely Japanese. Chinese ghosts wear a similar burial costume, but they saunter about on ghostly feet rather than float above nothingness like their Japanese cousins. …and yet, it cannot be said that all yūrei are footless. You can often hear the sounds of ghostly footsteps in older kaidan stories. In the popular kaidan Botan Doro the arrival of the yūrei Otsuyu is announced by the karan, koron of her wooden geta sandles. And in Noh theater, many of the ghostly characters sport magnificent footware. Ashinonai Yūrei did not appear until later. 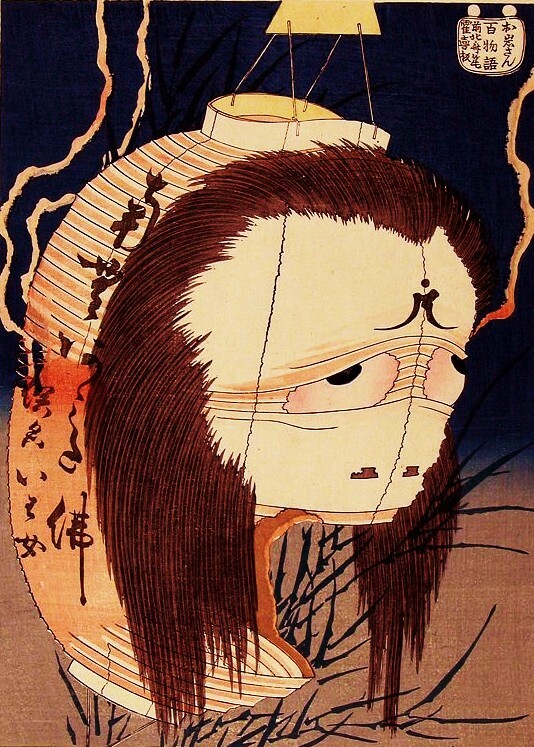 The origin of the ashinonai yūrei image is usually attributed to The Ghost of Oyuki, however the earliest known depiction appeared sixty years before Maruyama Ōkyo’s birth. An unknown artist drew a footless yūrei in the picture-book of the puppet play Kasannoin Kisakiarasou (1673; Quarrel Between the Empresses of Retired Emperor Kazan). The picture is just a small sketch in the upper-left corner of the page, but it clearly shows the vengeance-seeking yūrei Fujitsubo as a footless apparition. 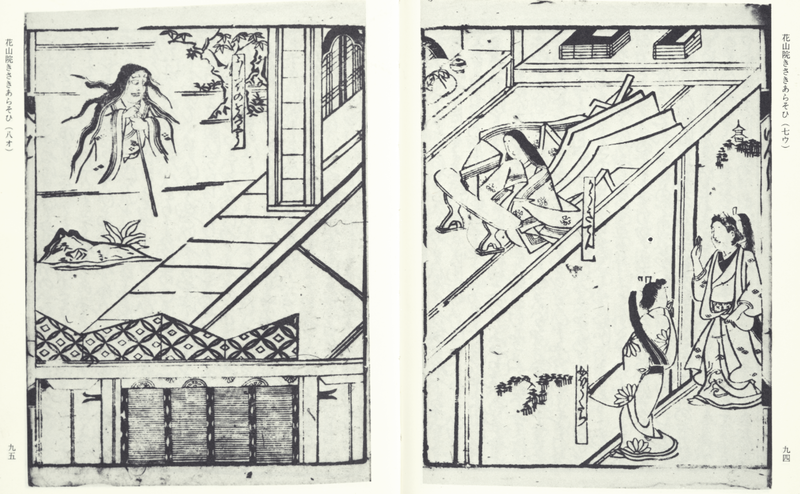 Another book from the same era, called Shiryō Gedatsu Monogatari (1690; The Story of the Salvation of a Ghost) also features a small image of a footless yūrei. It is not known whether Ōkyo would have seen either of these works. Speculation on the reason behind footless yūrei falls into a few main camps. One school of thought is that clouds were considered traditional vehicles of transportation for deities and ascended beings in Japan. It was said that these yūrei were being whisked around by clouds, but with the clouds not completely drawn in and only covering the feet. Another, more grim speculation is that the artists were influenced by a Chinese holy text called Juuou-e that says souls judged to be carrying sin in the afterlife will have their legs hacked off by demons and must crawl on stumps through the afterlife. Other, more romantic ideas have been proposed. In his book Nihon no Yūrei, Keio University professor Ikeda Yasaburo suggested that Maruyama Ōkyo was inspired by the haze of incense smoke rising into the sky, and drew his yūrei as if they were half composed of this smoke. 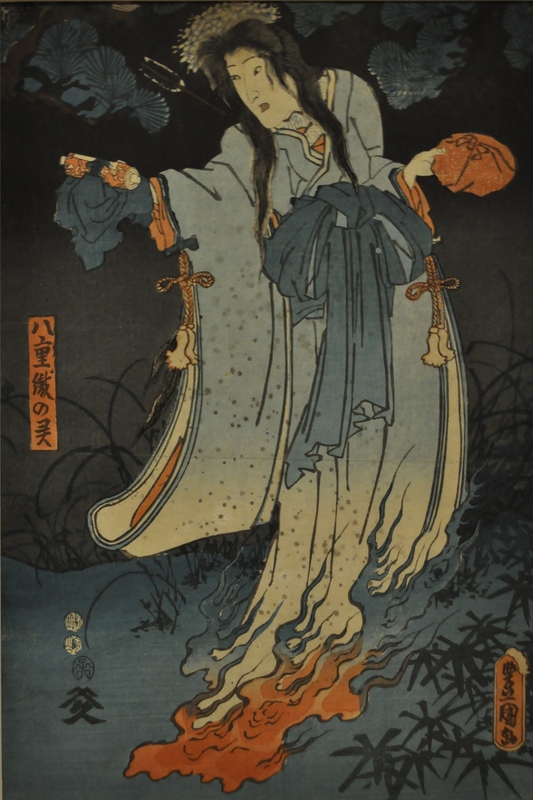 Others say that Ōkyo painted The Ghost of Oyuki from memory, and that the image represents his lover sneaking off to the bathroom at night, her bottom half hidden in the dim candlelight. Yet another unrelated theory says that ashinonai yūrei originate from Bunraku puppet theater, where long robes hide the feet of female puppets and the hands of puppeteers. It is most likely that a combination of these explanations is true. Whatever the reason, while the white face and wild hair of Edo period yūrei are still very apparent today, this absence of feet has not survived into the modern age. 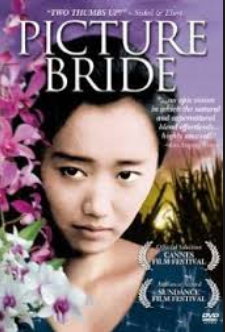 Only a few films, such as the 1995 Picture Bride, are still careful to retain this detail. For the most part the ashinonai yūrei is a creature of the past. One of the cold hard truths of publishing a book is page count. More pages = more costs, and sometimes you just have to trim! That means that several sidebars that were planned to go into Yurei: The Japanese Ghost had to get cut. But that’s OK! Because I can still share them here! I am happy to report that Yurei: The Japanese Ghost is officially at the printers. We should be getting a proof copy soon, and if all goes well then the book will be ready to be printed and delivered! Thanks again to everyone for your support and patience! Interesting comment on this motif. It does seem to be lively in anime portrayals of yūrei. The “Cardcaptor Sakura Movie” (the first one, 1999) involves the protagonist’s conflict with a yūrei, who is always shown hovering in mid-air, her heavy robes around her. In one dramatic scene, she rises high in the air, and we see that there are no feet or legs inside her robes. That’s a good connection to Card Captor Sakura. And yes, that’s usually the way it works. A yurei’s feet are hidden in robes or somehow obscured. I think you will definitely see that motif more in drawn art–in comics and anime–than live action. I think because visually it just doesn’t work as well. I have seen a few horror movies where they digitally remove the feet and it comes off as goofy more than scary. But in drawn art you can stylize it better so that it still gives the effect you want. One live action comes to my mind (namely しゃばけ), but I guess they used ashinonai yūrei, since it’s supposed to be jidaigeki genre. One of the things I find the most astonishing about japanese yūrei / yōkai is the fact, that it’s extremely hard to generalize anything. Even such a simple claim – yūrei have no legs – doesn’t have to be true for the time being. They’re anachronistic, but yet somehow able to evolve, even in modern era. Looking forward to read your book! Very interesting! Glad to hear that your book is coming into the final stretch and down to the wire. I guess if your not going to have this one in the book, I’ll have to copy it off and stick it in when I recieve my copy. Good Luck! Thanks! Yeah, it was tough when some cuts had to be made, but I think overall it improves the flow of the book. Too many of these sidebars were just me trying to cram in extra bits of information that didn’t fit easily anywhere else, and it came off as clunky. Plus we needed to reduce the page count. But that’s what the internet’s for, right? I can still post them here, so nothing goes to waste! So happy about the book being at the printer. You must have learned a great deal in the process and perhaps some day in the future you will be brave enough to apply it to a volume two. Thanks! And yes, I have learned a great deal. It’s almost embarrassing how naïve and optimistic I was when this whole journey first started! And I already have plans for another book! I, like all of Japan’s ghost. For example [Ashinonai Yūrei] is also thing of the past, I lifetime [Ashinonai Yūrei] will continue to support.